Believe it or not, even chicken keepers like to glam it up every once in a while. For a gal like me, this includes a pair of diamond earrings that my husband gave me when we had our first child. But I had no idea that my chickens would like my earrings just as much as I did! One day I went out to sit with my flock. My favorite hen, Big Mama, flew into my lap and nestled down for a nap. 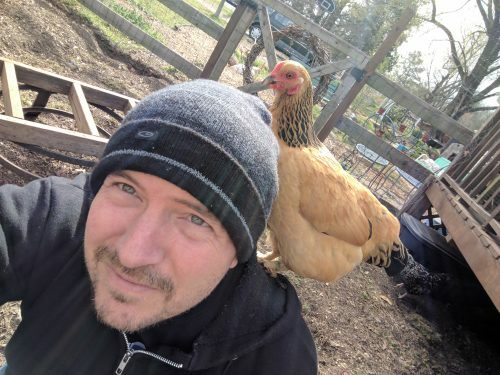 (If you haven’t trained your chickens to be lap chickens, I highly encourage it!) I was busy looking around, doing a visual inspection of my flock when I felt a surprise tug at my ear. Reaching up, I could feel that my earring was gone. When I looked down Big Mama was standing in my lap with my diamond stud clasped in her beak. This next step is where I went wrong. I should have carefully lifted my bird and calmly retrieved the earring from her beak. What I did was scream like a mad woman and fling my arms into the air, causing my flock—and Big Mama—to fly away in terror. 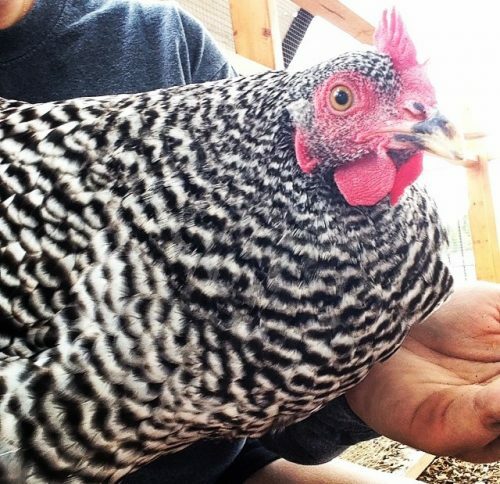 Chicken Activist Sally Bird—or as she is affectionately known, “One-Eyed Sal”—is a Barred Plymouth Rock and an activist for change within chicken-kind, an outspoken critic of the pecking order as it now stands, and an influential member of her flock. 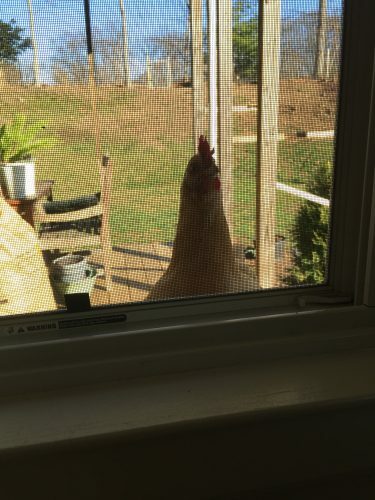 She granted us an exclusive interview from her coop and run on a lovely spring day in North Carolina. Thanks so much for your time today, Sally. Do you mind if I call you that? No problem. That’s my “given” name anyway, right? “One-Eyed Sal” is a nickname. You can call me either. Thanks. So before we get started, do you mind telling us the story of how you came to be known as “One-Eyed Sal”? Sure. Everybody seems to want to know that story! The short answer is, when I was a young chick I had a neurological problem that caused me to lose sight in one of my eyes, but fortunately, I was able to overcome that. We’re so glad you did! Does that history play a part in your activism today? Of course—yes—it does. I think I wouldn’t be as sensitive to the needs of members of the flock that are disabled if I, too, didn’t have my own struggles I deal with every day. Also, and this is important, if it weren’t for my early chickhood experiences, I wouldn’t be such an advocate for better healthcare for chickens everywhere. Here’s the thing: when I was struggling as a chick, my flock caregivers didn’t know exactly what to do. They weren’t trained vets and couldn’t find one to treat me, so they did what they thought was right: they set me away from the rest of the flock. Isolating a chicken with a communicable disease is usually the best course, but sometimes chickens don’t recover, especially without veterinary treatment. I’m lucky that I survived. Thankfully, my caregivers were checking on me regularly—they really did want to help if they could—and when they saw that I somehow recovered, only losing my vision in one eye in the process, they put me back in with the rest of my flock. As they say, the rest is history! So based on your experience, what changes would you like to see in the healthcare system? Because of my experience and the suffering I’ve seen in my flock, I’ve realized that we need chicken healthcare reform. First, there just isn’t enough access to good, qualified vet services. There are vets on every corner for dogs and cats, but in places you can go miles and miles and never find a vet that specializes in Avian Medicine. This needs to change. Also, even if my caregivers had found a good vet, they couldn’t have afforded the prices to get me good care. It’s unfortunate that access to a doctor does not mean true access to healthcare; too many chickens are excluded from good, basic veterinary care because our system drives costs up and drives accessibility down. I’ve been working hard so that average chickens can get the care they need at an affordable price. Those are huge, difficult reforms. Have you seen any progress? Yes. These reforms are very difficult, and it can be exhausting trying to fix “the system” day after day, but if I help just one chicken, it’s worth it! And progress HAS been made. One of the best examples is the accessibility to information for common chicken caregivers. There is SO MUCH helpful information out there! 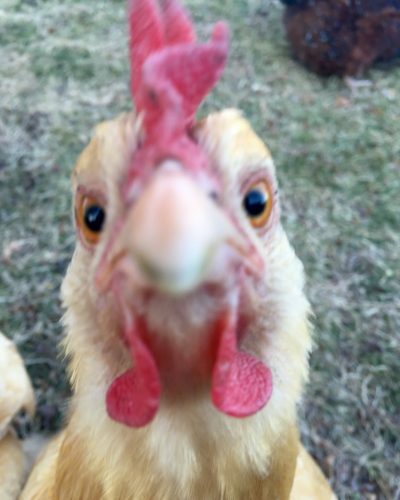 For example, your site, MyPetChicken.com, has a “Chicken Help” section with more than 300 articles to help caregivers provide the best care for their chickens. Of course, the best option for a sick bird is always to go to a veterinarian for professional assistance, but when that isn’t available, resources like these are invaluable! In fact, and I’m not ashamed to say this, since it happens to many of us hens sometimes, when I was egg bound, my caregivers were able to find helpful advice to care for me, and it worked. I’ll be forever grateful to them for that! You have been through a lot! Yet you’ve remained hopeful. Other than access to quality, affordable healthcare, what projects are you passionate about now? Yes, I’ve been through even more than the partial loss of vision. Maybe later I’ll tell you those stories! Right now I’m primarily interested in pecking order reform. I see this as a crucial issue for chicken-kind. Here’s the thing: because of my disability, I’ve always been near the bottom of the pecking order. Many of my flockmates see me as a liability to the flock instead of an asset. Even though I’m smart, resourceful, and kind, they still fear me because I’m “different.” Thankfully, since I am smart, I’ve been able to dodge trouble most of the time, but I can still feel like an outsider because one of my eyes doesn’t function properly. Being “plucky” is a characteristic of your breed, the Barred Plymouth Rock, after all, isn’t it? “Plucky.” That’s a funny word. When someone told me that described me I had to look it up! It was a new one for me. It means, “having or showing determined courage in the face of difficulties.” I like that! And yes, I guess it does describe me. But I don’t primarily see myself as a “Barred Plymouth Rock;” I see myself as a member of the overall chicken family. I want chickens everywhere to know that they don’t have to be defined by their breed, their size, or what others say about them. Anyone, anywhere, can be “plucky.” We all face hardships, and we can all show courage and determination in the face of difficulty. It’s not just for Barred Plymouth Rocks; it’s for everyone! As you can see, I’m concerned that we separate ourselves by appearance. Should bantams be picked on just because they are smaller? They were born that way, and I think we larger breeds shouldn’t discriminate against them for it. The same is true across all the breeds. I love to see Barred Rocks getting along with Speckled Sussex, and Silkies enjoying the company of Polish breeds. All the different colors, all the different feather patterns: I’m not advocating breed “blindness” (something I know about! ), but celebration of all this diversity! It breaks my heart to see chickens separating themselves by breeds, kinship, looks, when they could be learning from one another! Vive la difference, I say! What’s worse is when chickens from different flocks see one another as enemies and want to fight one another. It’s heartbreaking! We have to be able to learn to get along with one another. I know that, genetically speaking, we are “wired” to see those outside our flock as a threat, but though that may have worked to keep us safe in the past when we were so separated, now that we have such access to information through transportation and internet technology, it’s my dream that we can move past our genetic “wiring” to see that all of chicken-dom is one big family, that we are interdependent and need one another, and because of that understanding, have peace among ourselves. That’s a BIG dream. How do you think chickens can go about realizing that dream? Thanks for asking! There are some basic, fairly simple steps that can be taken to help new flocks integrate with existing flocks. You have an article on your website that talks about it, I think. First, as you know, training begins when we are young chicks, and that’s an important age to teach inclusion and acceptance. The main thing is we have to get to know one another—and that may be a slow process with starts and stops. And some personalities just clash, you know? But that doesn’t mean we can’t find common ground and work together for the good for our flock. It’s when we separate ourselves from one another, retreating into our own safe coops and runs and nesting boxes, and refuse to come out and see what another hen’s point of view may be… that’s when we have trouble. I’m not denying that there are real tensions in our flock, even real bullies, but we have to lower the stress levels, sit beside each other on the roosting polls, eat with one another at the feeders, and drink together at the waterers. When we do, we find that, though we may be different on the outside, on the inside we all have the same dreams, hopes, and goals. So are you saying that there should be no pecking order at all? No, if by “pecking order” you mean “social structure.” All social societies like flocks of chickens need structure and order. What I would like to see is “order” without the “pecking”! Imagine a flock in which leadership is not based on who’s the biggest or the strongest, or – even worse – the biggest bully, but a flock in which leadership is based on who brings the chickens together for common solutions best, who helps all members of the flock have their voices heard, who shares their treats instead of hoarding them. Leadership should not be based on which bird is the most threatening, but on which one exemplifies concern and care for the flock. Too often the chicken with the biggest squawk drowns out the voice of the others, and fails to take the next generation of chicks into account when they make decisions. If our decisions will affect future generations of chickens to come, why don’t we take them into account when we deciding what to do? Some say you are too idealistic, that you’ll never see these reforms. What do you say to them? Yes. I get that a lot. Here’s the thing: I’m AM idealistic, but I’m also realistic. Chickens have been doing things the way they do for thousands of years, and change takes time and patience. I’m willing to put in the time, to do the hard work, and I’m hoping to inspire future generations of everyday chickens to join in the struggle for peace and flock-mindedness. I know it won’t happen completely in my lifetime, but I can do my part, and so can you! Our interview went on to address many other issues including environmental reform, change requests for human caregivers, and her other “survival” stories. We hope to post the remainder of our interview in an upcoming blog. It’s amazing how a breed can go from relative obscurity to overnight global popularity! Welcome to the age of the internet! And we’re happy to help! But is it true? 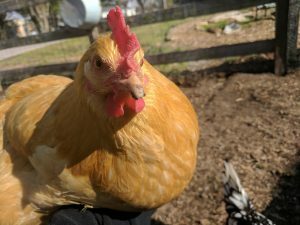 Do “giant” chicken breeds exist? Or is there some kind of camera trick going on here? And even if the birds in those videos are larger than average, are they really the “biggest in the world”? One source estimates there are as many as 19 BILLION chickens on planet earth, so how could you even know which one is the biggest? Did they measure every chicken on earth? There ARE giant breeds. And the giant Brahma isn’t even the largest! 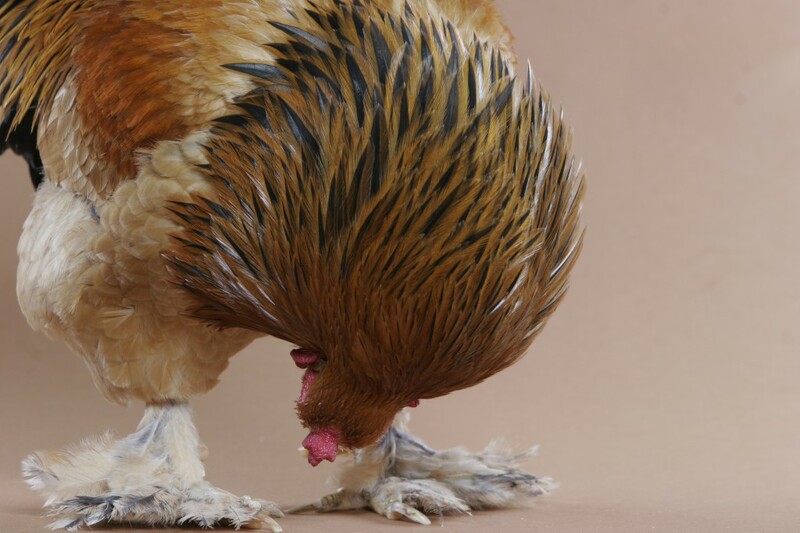 Surprisingly, the giant brahma star of those popular videos is NOT the largest known chicken breed. The largest recognized chicken breed is actually the Jersey Giant, which commonly grows to be a few pounds larger. Brahma roosters generally get as large as 12+ lbs, and hens will be about 9.5 lbs. or more when fully mature and well fed. The breed is relative slow-growing, and can take up to 3 years to reach full size, so it will take some time for a rooster to get really GIANT! So how about those giant roosters in the videos, are they bigger? It’s tought to tell from a vid alone, but those guys look like they may weigh as much as 20 lbs! Most Brahmas purchased in the United States will be closer to the “normal” Brahma size (which may still dwarf the other breeds in your flock). But a larger size and weight is possible if you choose to breed and rear for those traits. So, should you consider Brahmas for your flock? Absolutely! 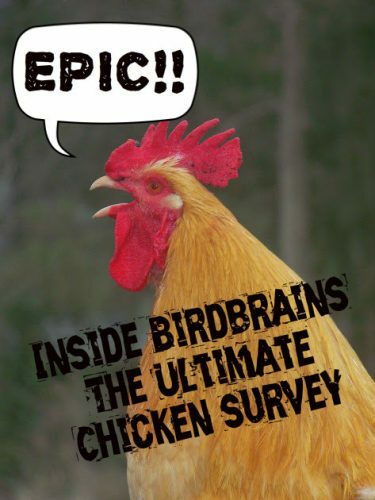 Here are seven great reasons to add a giant Brahma to your backyard flock! Brahmas are big! Not normally as big as the roosters in those videos, but they will grow to be very large compared to most standard-sized breeds, and could become quite a conversation piece in your flock. Brahmas are friendly! Brahmas are known to be generally friendly, docile, “huggable,” and quiet and tame. They’re kind of the Great Danes of the chicken world! Plus, they tolerate confinement well, so you don’t have to worry about flighty Brahmas. My Buff Brahma Bantam loves to get on my shoulder! Brahmas are beautiful! From their cool black hackle “necklace,” to their graciously feathered feet, Brahmas look fun and fancy, and they come in more than just white. The Buff, White, and Black varieties are recognized by the American Poultry Society. You can see the colors My Pet Chicken offers here. Brahmas make breakfast! They are can be expected to lay 3 medium-sized brown eggs per week, or about 150 eggs per year. You can’t get THAT from a Great Dane! Brahmas make good mamas! With a tendency toward broodiness, Brahmas have the reputation to be good setters, which will come in handy when you try to breed your own giant Brahmas! Brahmas are hardy! Cold? No problem. Heat? Yes, they can handle heat as well! Just bear in mind with any breed, if it gets really hot for a long period of time, you may need to intervene a little to make them more comfortable. Here are some tips from our Chicken Help section to know how to do that: What should I do if my chickens get too hot? Brahmas can be tiny, too! 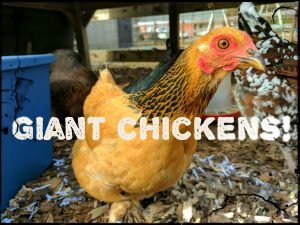 While standard Brahmas are among the largest chickens, Brahma bantams are a wonderful, tiny option to consider for those who love the Brahma but aren’t ready for the size. You can see our Buff Brahma Bantams here: My Pet Chicken: Buff Brahma Bantams. Have I stepped on anyone? At my house, we recently had the privilege of hatching some of My Pet Chicken’s Cuckoo Bluebars, and what an experience it was! 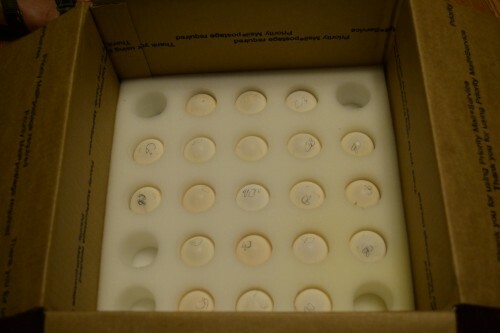 We have never ordered fertile eggs before, always hatching eggs from our existing flock, so even the shipping side was a new experience for us. You can also get cuckoo bluebar started pullets (which are older birds), but we love chicks and we love to hatch, so we started with the cuckoo bluebar eggs. When fertile eggs are shipped, the post office is instructed to hold them for pickup, but somehow, mine slipped through and were out for delivery with the regular carrier. Our fabulous Post Master tracked down the carrier, and hand delivered them right to my door! Love when we find somebody that goes above and beyond the expectation to get the job done! 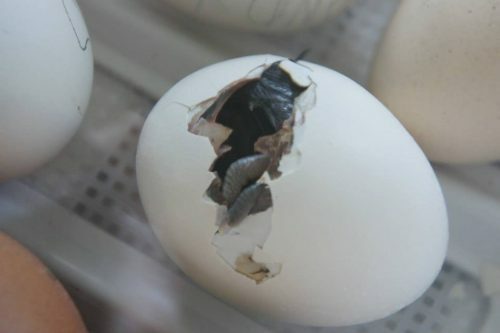 Bluebars will lay blue eggs… but they hatch out of white or cream colored eggs. Look how snugly and neatly these are packaged! It’s the Chicken Consultant again! You know me…chicken chatting is my profession. That in itself is difficult enough to explain to people when they run into me at the store, at a party or simply out and about in town. It does for sure cause a hold up on my errand days though. My store trip can go from a 5 minute “run in and run out” to a 30 minute discussion about a down-and-out hen for a lucky shopper who ran into me. Some situations with your bird can be outside the norm. This Chicken Consultant sure doesn’t have all the answers! This means I’ve been stumped more than once by some poultry mysteries. So, though I’m here to help, I may not have the answers you need. I sure do help as best I can, even if I can only get you on the right path to finding answers. These top 3 difficult questions are often best answered by thoughtful consideration, visiting veterinary experts, and/or process of elimination. I was ready for many adventures when I decided to start keeping chickens! I imagined us all in the garden working and snacking together. I envisioned us napping on the hammock under the summer sun. I knew we would have many interesting conversations, even though I don’t know how to cluck! The one thing that I failed to see was the loss of my privacy. Chicken privacy is something different—-something I didn’t expect! Of course, I opened the door to give her the treats. Fern peeks in to check for treats.